In the official Twitter-account Infinity Ward company has published the news about the upcoming returning of Captain Price - the English soldier, member of the British Army and strong leader, known for the previous game’s parts. At the image there’s combatant Price, who stands in front of the Stonehaven medieval castle from the last shooter’s part, titled Call Of Duty: Ghosts. According to the information, the Call Of Duty: Ghosts game is going to get another DLC, which will include the updated Captain Price’s skin, new weapon, special clothes, backgrounds images, gaming cards and other elements, needed for the character’s customization. However, there are no more details on how exactly Price will return to the project and what will be his role in it. The Call Of Duty: Ghosts game was released in November 2013. It’s the 10th part of the Call Of Duty series, available for PC, current and next-gen consoles. Let us remind you that recently, at the end of January, Call Of Duty: Ghosts received its first great update, including some new features and improvements, changes into the balance, bug fixes and more. 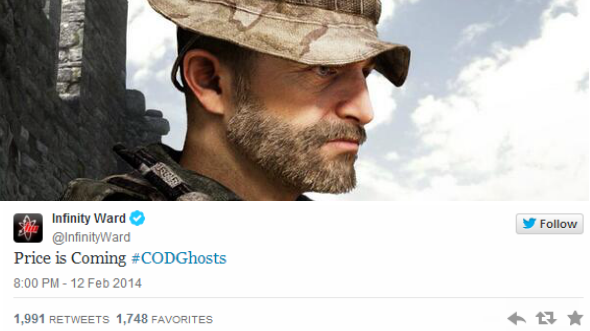 And what do you think about the Captain Price’s coming back to the game? We’ll be glad to hear your opinion in the comments below.